Don’t miss Robin Pascoe’s Far East tour – coming right up! No other ‘expat expert’ has quite such a punishing schedule as my dear friend Robin Pascoe. And just as I find myself returning to my own Middle East stomping grounds of Dubai and Oman (check out the Muscat International Mobility and Relocation conference in April), Robin regularly returns to the Far East. Fans of her great books, Homeward Bound, Moveable Marriage and Raising Global Nomads will know that she lived in Bangkok, Seoul and Beijing during her time in expatwifedom. Now she returns, going to Manila, Kuala Lumpur, Jakarta, Singapore and BAngkok, starting on Feb 17th. Her schedule is punishing, for she will be making 25 presentations during her stay. Do NOT miss this chance to meet her, hear her own personal stories that will resonate with you like nothing else. She’ll make you laugh, she may make you cry, but her solid wisdom and practical advice will have you leaving the room with a spring in your step – and a book in your hand. Check out her itinerary now here on her blog at Expat Expert. I have just returned from the Families in Global Transition conference in Houston (my 4th) and met up with old friends and new. As Barbara Schaetti, of Transition Dynamics says, ‘it is a reunion of strangers’. Don’t you feel like that sometimes? Anyway, Reiko Keehn is one of the new kids on the global transition block and was determined to take a photo of two old hands – Robin Pascoe and myself – with her. Robin and I hope that Reiko will take her youth and her enthusiasm into the world and become the trailblazer she deserves. I’m so excited. On Monday I go to Families in Global Transition in Houston. This is my fourth trip to the conference and the conference’s 10th anniversary. 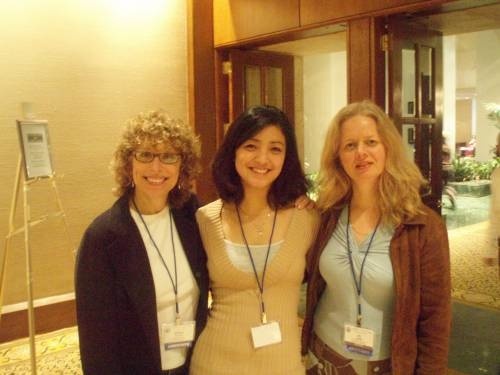 It is also 10 years since my first expat conference, when in 1998, I went to Paris for Women on the Move. It was there that I met Robin Pascoe and it was there that I first really ‘got’ why I felt like I did to be a global nomad. If you, like me, enjoy learning from the gurus, and being among other people who ‘get it’ maybe you should try one of these conferences. Do you attend any already? If so, please tell us which ones and don’t forget to add their contact details.